Oh Please.. who do they think they are! Cynicism is dead, long live over-enthusiasm! Well this particular workplace madness is over at last. Yesterday at around two-ish the High Heid Yin of SysDev came round pressing the flesh and schmoozing the troops as he made his decision for the Xmas decoration competition (posts passim). 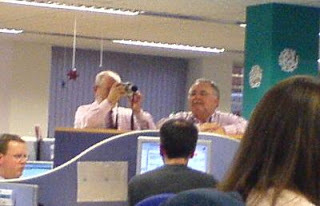 Worse than that he had two "representatives" from "corporate communications" in tow, taking notes and photos.. However eventually a winner was announced and the trophy (see below) was presented. I missed all of that though, because we'd gone out for our Team Xmas lunch. Well done everyone, but you're mad, every last one of you!